One can even willfully create this error, it has nothing to do with plugins, themes,… but with wp core! Which is so primitively programmed that it doesn’t realize that on another tab you are logged out of your site…! Hell yeah! When I click I always really really mean to do what i CLICKED. Doh! Instead, wo should always write “You are logged out, pl refresh this page to continue” – or better: it refreshes the page itself! Was about to write a comment just like yours David. Totally agree with you. This also happens to me sometimes when editing a blogpost, and then I hibernate windows. 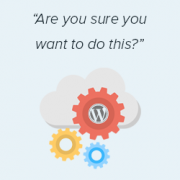 When I come back the next day or two to the same blogpost edit screen and edot a bit and try to save, the dreaded “Are you sure you want to do that?” message appears. Turns out Im already logged out and all I do is login and the message goes away. Thank you! Your steps helped me figure out why I was getting that annoying message. It was one of the plug-ins apparently. I am newly installing wordpress for a brand new site, and I am getting this error when I try to install a new theme from my machine as a zip file. I tried to delete the lines as you suggested in the config file. Still it has not sorted this issue. Being honest, yet they (WordPress) did not resolved this issue. I had the same issue this day, and I cannot cal it ”solved” because it is not solved. Indeed I had to connect the server via FileZila with my FTP to can add my theme (Divi) in wp-content>public_html>theme>and paste the folder with the whole theme from the zip file (do not paste the zip file into server). 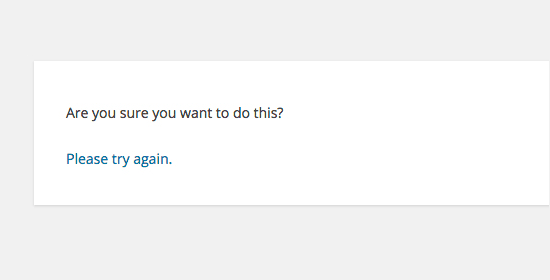 But the error is still in WordPress (not at mine) but WordPress did not solved this issue, yet. So, if you meet this error, say hello to it, smile, don’t be upset, smile again, drink some water, go to pee, come back, connect with your server, and enjoy. i have same problem then i have changed my theme from twenty seventeen to twenty sixteen and it has worked properly. I recently installed WordPress on my Windows VPS using WAMP with Remote Desktop Connections, so no need for an FTP client. Unfortunately, when I tried importing my WordPress dot com file to the one on my server, it gave me this error, followed by please try again. I think I remember checking the box to upload all attachments, and I assigned a user from the dropdown menu. In the WWW/name_of_site, I don’t have any plugins or themes folder, so I don’t know if it was caused by either one of these. Also, do you have any articles on explaining the difference between web hosting shared hosting, cloud hosting, or VPS)? I tried to navigate to ip_address/name_of_site on another computer, but I got a 403 forbidden message. What could be going on? I would greatly appreciate it if you could answer my questions. I found that on my website when I tried to activate/deactivate a plugin in one window without refreshing the page this error would come. I mean i have logged into the admin panel and onto the plugins page and in a new tab i login again then i need to refresh the plugin page before activating or deactivating plugin else you get the above error. Tried lots of things but this worked…. uploaded the Zipped folder of the ‘WordPress only install’ then extracted the files. Then moved this unzipped folder into the Themes folder. Please see our guide on how to install a WordPress theme. I increased the post_max_size and upload_max_filesize limit in PHP version editor in cPanel to fix this. This worked for me. I’ve only got 3 plugins and the default twenty seventeen theme and I still get this error when trying to upload the theme I bought. I logged in to my cPanel -> PHP version selector -> switch to PHP options. Increased both post _max_filesize and upload_max_filesize to 16M and it worked. It was set by default to 2M for me and the theme I was trying to install is 9MB. Thank you Bob M for sharing this fix. Absolute life saver, thank you! This didn’t work for me but is still worth knowing how to troubleshoot. What did work for me was to upload the file (unzipped) via Filezilla FTP. I had the “Are you sure you want to do this”..but I was attempting to load the .zip file of “All files and Documentation” from theme forest. I instead downloaded the .zip of “Installable WordPress Files Only” and loaded that the stand way in Appearance -> Themes and it worked. Maybe this will help some folk. Clearing personal browser cookies for the specific site did the trick for me. May help someone out . . . may as well clear personal browser cache too . . .
I’m not sure if that’s possibly the reason (I’m the super newbie) but after dragging the zip file to the desktop instead of uploading directly from the download folder it worked. 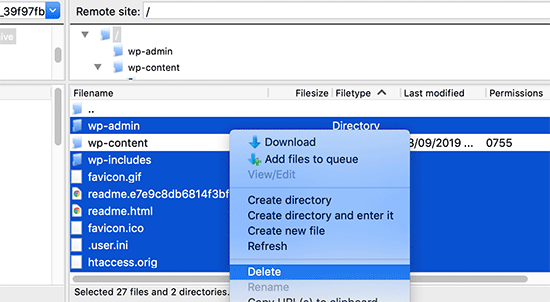 Go to your wordpress folder project —> wp-content. Extract your theme to this folder. Don’t try to put in a .zip file. Thanks, Phill. Copying the extracted folder into wp-content worked for me too. i am getting message while uploading new zip theme “Are you sure you want to do this? So I found the plugin that is causing the error. How do I fix it? Report the error to the plugin author. I.m getting error while uploading new theme. Just increase the size of file upload and execution time. and restart all services will work fine. I am writing new theme (follow a book) and I get this fuzzy error message when I try to activate it. I performed the same steps in the article and was unable to resolve my issue as well. I received the same error message as the article describes and noticed my upload size was only 2MB. I plan on increasing the upload size and this should (hoping) to resolve my issue. How big is your upload size? See if this is your issue. I don’t think I understand the steps in the last solution. I’m confused by the wording: So I don’t add the section “‘Authentication Unique Keys and Salts”, which means don’t keep any of the green text. But then if I delete all of the lines that begin with define, that eliminates all of the remaining posted text. So am I just removing all of these lines from the wp-config.php file? Edit: I was actually able to solve my problem by creating a php.ini file, similar to Anthony Gore’s suggestion, through cPanel. I still think the instructions above are confusing though. I got this at login so had to do the plugins and themes deactivation through FTP. Still couldn’t find the issue but then had a look at the URL and it was not just mysite.com/wp-admin it was like an old URL where I had been clearing the cache of my browser and it logged me out the site. So I was trying to login to what was probably an old temp URL that didn’t exist anymore. this is the problem for Ripped themes ?? been trying for days, how & where can I find php.ini?! Login to your server using FTP. Then find php.ini under /etc/php5/apache2. etc/ is empty for me. old problems but same solutions : Incase one of you are not able to locate php.ini, please create a new php.ini or contact your hosting provider, they will give access to php.ini, if they don’t give, then create a php.ini..
current status resolved after creating new php.ini. Thank you so much! Unfortunately I’ve tried everything else before I read comments but finally it’s working. Thanks again. I fixed it by removing cookies for the site in question. It was because I moved the install to a new server. Did you try replacing the SALT keys from your wp-config.php file (last solution in the article) ? I’m in the same situation also, the last solution doesn’t make sense, must be something to do with the premium theme I’ve downloaded… I’ll have to get in touch with the author. No joy. Brand new install of WordPress. No plugins. No other themes except default. Same error. That must not be the problem, but I can’t figure it out. I just upgraded to 4.0 and now I cannot publish any posts- can I roll back to 3.9? I have an issue with a practically clean install of wordpress (latest version). All plugins deleted. Theme is “Twenty Thirteen”. I get this message when trying to delete a single comment. (I haven’t tried changing the config file to take out the definitions of the keys). “Users must be registered and logged in to comment” is checked. “Anyone can register” is not checked. I am the only user at this point. There may be some issue that does not enforce the rules. And then the leak somehow messes up the comment stack. I sometimes have this issue when trying to save jetpack custom css and I’m not sure why. Can’t deactivating your theme cause problems with you widgets no longer having their content as set up — and then — you are stuck redoing what might add up to significant duplicate work? I’m not advanced enough to know if I’m even asking that question correctly. But recently I worked on a site, switched themes and than ARGH! I had to go back and redo a lot of work getting the right content back into the right widget.